We join Carly, Jace, Simon, Alec and Isabelle just weeks after the last book left off. Everything seems to be back to normal. Valentine and Sebastian are dead, Carly and Jace are together, Magnus and Alec are away on a romantic holiday, Jocelyn and Luke are getting married and Simon is not only dating Isabelle but Maia too but then it all changes. Shadowhunters are being murdered and found in the known locations of each of this world's creatures territories, Jace is distancing himself for Carly and somebody is after Simon. 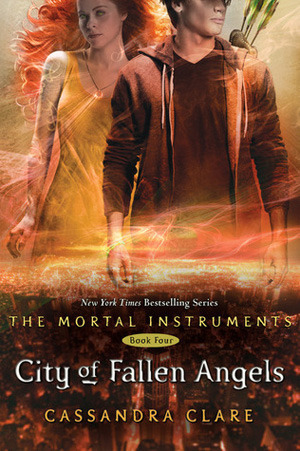 I wanted to love this book, I really did, but there was just something that didn't do it for me with this installment of The Mortal Instruments. Don't get me wrong, I enjoyed it, but I just didn't get completely sucked into the world in the same way. I can't exactly place why it was that way for me with this installment. I think it was probably a couple of things bundled together. The main thing was the strength of the story, it didn't seem as strong to me this time around or as well developed and, I'll be honest, I found parts (mainly the Simon story) a little boring at times. Although, there were parts I loved with this book. I loved how we got to see the internal turmoil Jace faces over his past with Valentine and just how much he doesn't want to be like the man, who until recently, he and those around him believed to be his father. Then there was Clary, I loved seeing her start to become a Shadowhunter, it really does seem like she belongs there and I think over the next two books she will begin to see so even more than she does now. Oh and then there's Magnus, he is at his best in this book. I think he's probably my favourite character in this series, he is who he is and doesn't apologise for it in any way, which I love. He is the perfect balance to Alec and I truly believe they are one of the best couples in this book.